Cluster development is a land development design tool that provides a means of both preserving open space and allowing development to be directed away from natural and agricultural resources considered important for protection by the municipality. Cluster development regulations are implemented through the municipal zoning ordinance and subdivision and land development ordinance in order to provide applicants with appropriate design standards and to provide municipalities with adequate information on development plans. Depending on the type of design and the regulations that apply to the cluster development, up to 75 percent of a site's land area can be preserved in permanent open space using a cluster design. Deerfield Knoll in Willistown Township, pictured here, preserved nearly 78 percent of the original parcel as open space. The open space can include natural and historic resources, woodlands, recreational facilities, as well as agricultural activities, depending on the priorities of the municipality. This eTool identifies the issues that municipalities will need to consider and address to promote and achieve effective cluster developments. It also discusses a general approach to ensure that cluster design standards and density regulations will create adequate incentives for developers to choose this development option. Cluster development is most applicable in a Suburban Landscape where there are still a significant number of large undeveloped parcels. It can also be applicable in the Rural Landscape, Agricultural and Natural Landscapes where open space preservation is identified as a priority and more aggressive open space preservation techniques such as Transfer of Development Rights or Effective Agricultural Zoning are not practical. Energy Conservation: Less land disturbance, fewer environmental impacts and less infrastructure results in reduced energy consumption. Open Space Preservation: Cluster developments preserve open space and can protect scenic views. 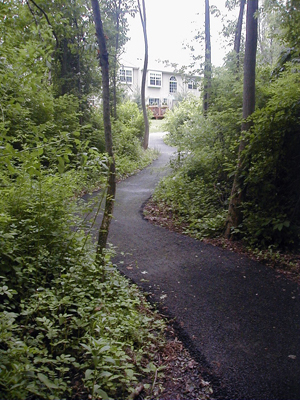 Environmental Conservation: Cluster development can result in fewer environmental impacts than conventional development, such as the reduction in impacts to natural resource areas, woodlands and steep slopes can be protected, less stormwater runs off into wetlands, and impervious surface coverage is reduced. Encourages Neighborhood Development: A greater sense of community can result due to the cluster development design, because homes are typically placed closer together. Greater Design Flexibility: The flexibility of cluster development designs can use open space as a screen and buffer between incompatible uses. Lowered Construction Costs: Cluster designs typically result in lower infrastructure costs for the applicant and lower maintenance costs for the municipality. Recreational Opportunities: The open space in cluster developments can be used for recreation. Public Water and Sewer: Cluster developments typically rely on public sewer and water utilities due to reduced lot sizes. Potential Agricultural/Residential Conflicts: Cluster development in agricultural areas can create potential conflicts between residential and agricultural uses, particularly when allowing continued agricultural use of the protected open space within a cluster development. The following is the basic planning process that should be followed to implement cluster development provisions. Establish Policy Basis: Prior to amending municipal ordinances with cluster provisions, a municipality should establish a policy basis for such provisions in its comprehensive plan. Amend the Zoning Ordinance: Cluster provisions are often included in a new "Cluster or Open Space Development" article in a zoning ordinance, but can also be added to an existing article containing general standards or provisions. Specific cluster bulk and lot requirements (density, open space requirement, incentives), and the zoning districts where cluster development will be permitted should be identified. To be effective, cluster regulations should require at least 50 percent open space. Amend the Subdivision and Land Development Ordinance: The subdivision and land development ordinance should be amended to ensure that all information needed to review an application for a cluster development is included in the plan submittal requirements. Specific design standards for roads, screening, layout, and sewage disposal within the cluster development will also be needed to ensure the cluster development meets the community's design goals. The subdivision and land development ordinance should include regulations that strongly recommend the submission of a voluntary sketch plan to facilitate a discussion between the applicant and municipal representatives early in the application process regarding community goals for this type of development. A municipality must consider a number of factors about how its goals for cluster development can best be achieved. Promotion of Cluster Development - Permit, Encourage, or Require? Permit Cluster Development: By merely allowing cluster development as a permitted use, municipal officials rely on the potential savings in infrastructure costs and flexibility in design associated with cluster development to encourage developers to choose this option. Note that many municipalities prefer to allow cluster as a conditional use, but developers are more likely to choose cluster if it is permitted "by right". Alternatively, procedural incentives can be offered by permitting cluster development as a by-right use, while requiring conventional subdivisions to go through the conditional use or special exception approval process. Providing larger incentives (such as 25 percent and up) to cluster. This can be very effective, but, depending on the base density, could result in significantly more units and reduce the amount of open space that can be protected and can require upgrades to existing infrastructure. Significantly reducing the amount of development permitted with conventional development (possibly one unit per five or more acres) while maintaining higher permitted densities (one dwelling unit per gross acre or greater) for cluster development. Require Cluster Development: Some municipalities have taken this approach to the next level and require cluster subdivisions as the only option (mandatory) for larger parcels (20, 30, or 40 acres) in certain zoning districts. Elk Township, for example, requires cluster development on all parcels 30 acres or larger in size in their R-2 District. There is a direct correlation between how much open space is protected and the net densities that result in the developed portion of a cluster development. For example, to preserve 75 percent open space on a tract in a one-acre zoning district through the use of clustering, lots of about 10,000 square feet must be permitted. The higher the net densities that a municipality is willing to permit, the greater percentage of open space that can be preserved. A key issue to consider when permitting higher net densities is how sewer service will be provided. A cluster development using one acre lots has limited effectiveness in preserving open space. The need for alternative sewage systems is a key to allowing cluster development in municipalities that are accustomed to dealing with individual systems and some municipalities may not want to risk the responsibility for repairing community systems that may fail in the future. Appropriate design standards for cluster development must be in place or the visual impact of cluster development can be comparable to conventional development. These are important considerations, particularly where there may be market resistance to smaller lots or cluster design in general. 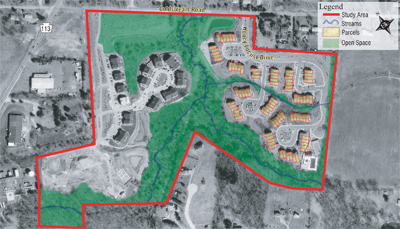 A municipality can help to address this attitude by working with developers to provide amenities in cluster developments, such as integrating recreational facilities or a trail system into a cluster development design as shown in the image to the right. Developers can also be required to provide additional landscaping and screening as part of the land development plan to screen incompatible uses. A primary consideration for cluster development is the use and management of the preserved open space. The municipality should require an open space management plan to be submitted by the applicant that addresses permitted uses in the open space, maintenance, and ownership. Uses permitted in open space can include natural and historic resources, recreational facilities, as well as existing agricultural uses. Stormwater management facilities may be appropriate in the open space if they are designed as community amenities such as ponds or created wetlands. Permitting the preservation of agricultural resources in open space should be coordinated with strict design standards that are designed to limit conflicts between the existing agricultural use and new residential uses. Just as fences often make good neighbors, design standards can help to mitigate potential problems between homeowners and farmers. These design standards should include setbacks that provide adequate area for buffering and/or screening between uses similar to the technique used in Pinebrooke pictured here. Elk Township has utilized a cluster development option in their R-1 and R-2 districts since 2002. West Caln Township has utilized cluster provisions in their Site Responsive (SRR) and Rural Residential (RR) Districts since 2005. Newlin Township has utilized a form of open space zoning since 1990. Its Flexible Rural Development District (Article 3) of the Zoning Ordinance offers five development options with up to 60 percent site open space. Conservation subdivision design requires the consideration and preservation of resources on the site during the development process. The most important step of the Conservation Design Process is the siting of dwellings. This step is performed without consideration for lot sizes or dimensions. Without such limitations, dwellings can be positioned to take advantage of views, and solar and wind orientation. Dwelling sites are located so that they pose the least impact on resources and take advantage of open space views. The resulting design takes advantage of the best locations to build based upon site conditions. This innovative process, when combined with other planning techniques such as cluster, can greatly assist in the protection of natural resources and an interconnected network of open space within the municipality. The Pennsylvania Department of Natural Resources promotes conservation designs in its website, including examples of implemented designs. The Pennsylvania Municipalities Planning Code provides the authority for cluster regulations. 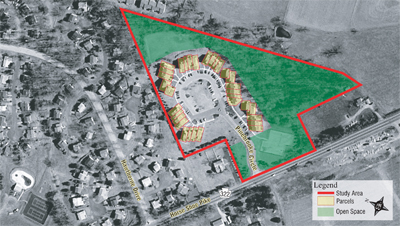 Specifically, Article V Subdivision and Land Development allows municipalities to adopt in their subdivision and land development ordinances "Provisions for encouraging and promoting flexibility, economy and ingenuity in the layout and design of subdivisions and land developments, including provisions authorizing alterations in site requirements and for encouraging other practices which are in accordance with modern and evolving principles of site planning and development" [Pennsylvania Municipalities Planning Code Section 503(5)]. Provisions for allowing density bonuses and other innovative design elements are also authorized in Article VI Zoning, which permits zoning ordinances to include land use classifications and districts: "For the purpose of encouraging innovation and the promotion of flexibility, economy and ingenuity in development, including subdivisions and land developments as defined in this act, and for the purpose of authorizing increases in the permissible density of population or intensity of a particular use based upon expressed standards and criteria set forth in the zoning ordinance" [Pennsylvania Municipalities Planning Code Section 605 (3)].